A special five-year, long-term EU-wide residence/work permit applies to non-EU citizens who can prove they have been legally living and working in Greece for a minimum of five (5) years with a full residence/work permit. Please take the time to read this article, which is unavailable anywhere else since March 2007 and updated with the latest information from official documentation and first-hand experience. The Ministry of Interior announced that a new Immigration Code had been drafted, which would grant EU-wide status to certain long-term residents and simplify bureaucracy, but nothing has been officially published and existing laws are still in effect. *Article last updated on January 2, 2015. However, answers in ‘Comments’ reflect a specific case or whatever laws were in effect at the time. I am waiting for someone to complete the process to provide the latest details. Image was intentionally Photoshopped to remove vital elements, protect privacy and help prevent forgery. An INFOrmation guide and two lawyers plagiarized this post and falsely attributed the source as an official government website that contained no information on the subject, reusing first-hand details from my life and rewriting them as their own. b) less than 10 months total in five (5) years. If you have been outside Greece for more than six (6) months on one occasion, then you are not considered ‘resident’ in Greece. If your absences in Greece prevent you from applying, you must delay your application until eligible. *Immigrants in Greece for study or vocational training purposes, asylum seekers and refugees cannot apply for this permit. Local “dimos” (municipality offices), foreigners offices (grafeia allodapon), kentro exipiretisis allodapon (in Athens only from 8:00 to 20:00) or nomarxeia (prefecture offices) accept applications during certain hours, usually early in the morning starting at 7:30 a.m. There is no nationwide standard — some take appointments, some see a limited number of applicants per day, and some operate on a first-come, first-serve basis on specific days. In smaller towns and rural areas, the local police station will have an Allodapon or Foreigner division, where applications are processed. Staff will often only speak Greek. A Greek-speaking friend, relative or associate may be necessary; a lawyer or attorney is not. — Latin letters are acceptable, and translations to Greek are needed for passports without Latin letters. See “Official translations to Greek” if you require assistance. — Some applicants may be asked to provide one (1) photocopy of each passport page, although legislation was passed in 2008 that did away with this requirement. — If you had more than one passport in the past five (5) years, you need to provide four (4) photocopies of the main page of the expired one(s). — Annual income must show at least 8,500 euros, plus 20 percent for a dependent spouse (or 1,700 euros) and 15 percent (or 1,275 euros) for each dependent child under the age of 18. 6. A certified dilosi signed by the owner of the home that you reside at that address without paying rent, stamped and certified by police. — This requires successful completion of 150 hours of free Greek language classes administered by the education ministry’s General Secretariat of Adult Education (IDEKE) or a passing grade on its test equivalent. 7. Certificate/diploma from any high school in Greece. — This requires successful completion of 25 hours of free Greek history/culture classes administered by the education ministry’s General Secretariat of Adult Education (IDEKE). See “Free Greek language lessons” to learn how and where to sign up. * Note: I always keep a photocopy of everything before giving over the folder, in case the office loses my file (which has happened 5 times in 10 years). A public official will check, verify and bundle your documents in the fakelo, then issue a bebaiosi (blue paper with your photo). It is not a new or temporary residence/work permit. It is a certificate of receipt that your papers have been accepted and are being reviewed for the possibility of permit issuance. Before a long-term EU-wide residence/work permit is issued, you must attend an interview at the regional office (perifeiria) to examine your moral character and worthiness at a specific date and time according to a certified letter sent to you within 90-120 days. You must show up. If the interview goes well, the board will instruct authorities at the interior ministry to issue the permit sticker or card and you will notified by telephone or be required to call the municipality office or check on its status in person as to when it is ready for pickup, usually within 30 days. * Access to paid and unpaid employment, conditions of employment and working conditions. * Education and vocational training, recognition of qualifications. * Welfare benefits — family allowances, retirement pensions, sickness insurance. * Social benefits — possibility of tax relief, access to goods and services; freedom of association and union membership; freedom to represent a union or association. * Access to the entire territory of EU member states — subject to the rules and conditions of the new member state. (Note: The second member state may refuse applications for residence only where there is an actual threat to public policy, public security or public health). * “Enhanced protection” against expulsion. This means they may only be expelled from the country if they pose a “serious threat” to public order or domestic security that impacts a fundamental societal interest. Decisions may not be based on economic considerations. If your application for a long-term EU-wide permit is denied by Greece, they will inform you of the reasons when you check on its status. If these reasons can be fixed with time or additional documents, you will be allowed to apply again. The 600-euro fee remains under your name but is not refunded. It is said that the fee can be used to apply for a future permit without further payment, but I advise you to keep copies of the receipt and/or have a municipality employee certify a document attesting to this. Applicants also have the right to file an appeal at the municipality, contact the Greek ombudsman to intervene, or take legal action by hiring a lawyer and filing suit. How many non-EU citizens in Greece have this permit? Although a majority of non-EU citizens have been in Greece for more than five years and an estimated 250,000 qualify, only one person held this permit in December 2007, less than a dozen by April 2008 and only 106 in October 2009. Why? — The original application fee of 900 euros made it cost prohibitive, since the average salary in Greece is 200-300 euros less. — Many Greek employers refuse to offer social insurance to foreigners, expecting them to work illegally or pay for their own insurance, which is costly. — Greek language requirements have been changed at least three times since 2006, plus the certificate required for this permit could only be secured by passing a test that did not exist until mid-2009. — Many immigrants still face obstacles in even signing up for free Greek classes because employer consent is required to sign up, classes are only offered twice a year — and during the day, which makes it impossible for employed persons to attend — and there is an annual enrollment limit of 3,000 students. e) you are outside Greece for at least six (6) years. Applicants must apply for renewal of the permit for another five (5) years at least 60 days before the expiration date. Many, but not all, of the same elements are necessary. Please note that these are the eligibility requirements for Greece only. Other EU member states have requirements (often easier), fees and laws unique to their country. The long-term, EU-wide residence/work permit from Greece described above entitles you to live and work in another EU member state — except Denmark, Ireland and the UK — but you are subject to the rules and regulations of the new country. Your newly chosen country may allow you to swap 1:1 for another EU-wide permit or give you a long-term permanent residence permit good only for their country, thus stripping you of EU-wide status and requiring you to stay five (5) years to again achieve EU-wide status to move again. This is why it is wise to check with the country of interest before you move. If you do not have the special long-term EU-wide permit described in this article, you have a Greek permit good only for Greece and do not have permission or authorization to work anywhere else. Please read the comment policy posted in “Comments, Questions and Contacting Me” before asking a question. *The ability to ask questions is now closed due to 90 percent of people asking redundant questions and not reading the information available. I do not source anything from official websites because they reflect policies, not reality. I’m trying to access a post about non-EU spouses of EU citizens applying for an EU-wide residency permit, but apparently I need a password to do so. Is there some place where I can sign up and access the post? I’m really curious about how to go about this. We live on Hydra, but we’ll be getting married in the States in a few weeks, and I’m hoping to get all of the paperwork submitted and returned before I return to Greece. The spouse permit is not EU-wide — it says this clearly in the first two paragraphs. It is only for Greece and one of the easiest pieces of bureaucracy to complete. Second, the EU-wide permit only applies to non-EU citizens (not married to EU citizens) who have been working in Greece for 5 years with a permit and meet a number of other requirements detailed above. b) You can only get a Greek passport if you have Greek citizenship. You can only get Greek citizenship if you have lived here for 10 of the last 12 years (so you have 2 more years to go) and go through the complicated/expensive naturalization process. You could have found the answer to your question very easily by doing a “Search” or looked at “Categories” in the 2nd column. Articles for “Greek passport” and “Greek citizenship by naturalization” are there. 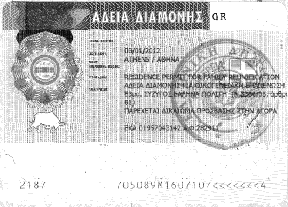 Will having a greek residence permit / work permit allow me to work in other EU countries? If not, how can a non-EU spouse of a greek citizen obtain a greek passport? b) Same answer I gave to both the commentators above you. I’ve provided all the answers for you in this article and the article linked/listed in the first paragraph; all you need to do is take a look. Thank you. hello i am albanian and for the last 12 years i have been living in greece. i went to greek school,i had a working permit and from june i applied for a 5-year working permit but i didnt recieve it yet. i m in france rightnow attending a french university. the documents that i have here is student permit not working one. can i transfer my rights from greece to france?can i work with the greek papers in france? Depends. If the five-year working permit was the special long-term EU-wide permit costing 900 euros, then yes you can live/work in France. However, if it was any other kind of Greek permit, then the answer is ‘no.’ There’s no such thing as transferring rights, unless you have the special long-term EU-wide permit because rules in Greece are different from rules in another EU country; the EU is not one country with one set of rules. Further, you cannot do anything until you receive the real permit. Just a quick one to say I think you have managed to compile the best, and most accurate information about the joys of living and working in Greece I have managed to read in my 11 years of living here as a Non-EU citizen. Looking to get the EU wide permit if I can find the time to go back to school for 150 hours!! Hi Matt, thank you so much for your kind words! It means a lot since it sounds like you and I have been here the same number of years, so we know how bad the “official” sources are and how hard it can be without some guidance or language skills (at the beginning). Yes, 150 hours! Thanks for great and useful informations. I have learned recently that there are some new changes introduced with a related law. A child of non EU parents born in Greece, is automatically eligible for a permanent residence permit (and some differences in acquiring citizenship), permanent as a lifelong? If anyone knows more details on this I would be grateful for any information. Everyone should keep in mind that I run this website, update its 350 articles, curate the Twitter news feed, quash plagiarism and dispense advice in my unpaid free time when not at my full-time job and tending to my own life. I ask readers to be patient, or please offer me a helping hand. Thank you for your encouragement and for stopping by. It’s 2 am, and I must go to sleep before my head explodes. All best. hey i have a permanent residency here in greece, am a non eu. my permanent residency is going to expire in one month, i was planning to go to sweden for holidays, is it possible? Question is already answered above. As it says under “Renewal,” you are obligated to start renewing your permit in Greece up to 60 days prior to expiration. If you have the special EU-wide long-term residence permit for Greece, you can swap for the same permit in Spain or another they denote as the equivalent, which may not be EU-wide. If you do not have the special EU-wide permit issued by Greece, you must start from nothing to earn a permit in Spain. In either case, you should consult Spanish authorities before leaving because not following their rules/laws can endanger your status and may leave you with no permit if you accidentally do something wrong. Basically you end up demoting yourself from “EU-wide permit” to “Spanish permanent one”.. Thanks so much for the link, which confirms my previous answer about the Greek permit being swappable for the same or another deemed equivalent by Spanish authorities. Laws change often, and I do not intend on becoming an expert on all 27 member states. My impression is the commentator above did not have the EU-wide permit and thought he could just move to another EU member state with any Greek residence permit, and that isn’t true. c) qualify as the spouse/child of an EU/EEA citizen according to the rules set out by each country. All countries have different laws, so you need to do research if that applies. I wanted to add something to this post that might be of importance regarding #7 and #8 under the ‘How to Apply–you need:” section. I possess the IDEKE certificate for Greek language lessons, for the 150 hours of A2 Greek language, and the 25 hours of Greek history and culture. They told me today (01/08/11) at the Kentro Exipiretisis Allodapon, where I go for my permit, that they need the certificate from the Greek exam for A2. The IDEKE certificates don’t take the place of the certificate for the A2 Greek exam (exetaseis pistopiisis tis ellinikis glossas). My teacher in the class had also told me that, so I was expecting to hear it today. Anyway, just thought I’d mention that. I possess all the other documents, which are the same as your other listings, and they’re all fine. I’m going to the Minitry of the Interior tomorrow to see if there’s any additional information on this subject. I can let you know what I find out. If I have permanent residence here in Greece and I want to take special long term residence EU-wide, do I need also school certificate and is the same process to apply? Please give me information on how can I apply and what document do I need? It appears you didn’t read the article. If you have permanent residence through marriage to a Greek/EU citizen, you are not eligible for the EU-wide permit. It says this in the first sentence. If you were eligible, the article lists all the documents you need and how to apply. I come from Jordan and I am a holder of a permanent residency permit in Greece since 2009. In May 2010 I relocated to Cyprus as my wife is cypriot citizen and since then I didn’t visit Greece again. Did I lose my long-term EU permit in Greece? You mentioned above that in order to loose the long-term EU permit in Greece, someone should be outside the EU for 12 consecutive months or more and Cyprus is an EU country, so my permit didnot expire yet. is that right? Non-EU spouses of Greek/EU citizens are not eligible for the EU-wide permit in Greece described above, as I say in the first sentence. Therefore, you do not have this permit and info in the article doesn’t apply to you. Do you have a regular five-year residence permit/card or the permanent 10-year residence permit/card issued by Greece? Only after receiving this information can I give you an answer.